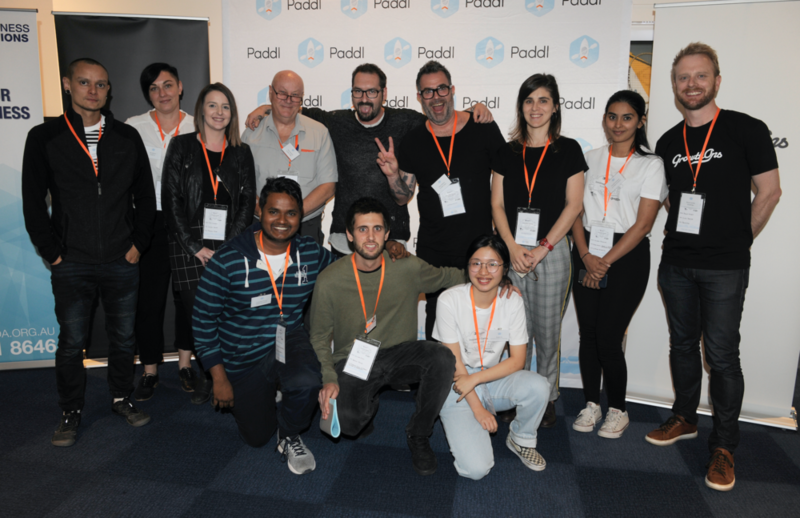 Paddl Co. partnered with GrowthOps, the Victorian Government and COSBOA to deliver the fourth instalment of the COSBOA Innovation Games (Victoria) series for 2018/19. These intensive, high-profile, one-day Paddl Games Challenges are designed to give a diverse set of emerging talent the opportunity to work with real Victorian businesses on real business solutions, centred around a Challenge Theme set forth by the host sponsor. For this event, GrowthOps set the tone of the day with the Challenge Theme of ‘surfacing high-impact growth solutions for your business’. Day 4 of the COSBOA Innovation Games sponsored by GrowthOps saw 11 participating small businesses and its employees, 9 sponsor businesses, and 60-70 students and graduates work alongside 30 GrowthOps mentors to drive innovative solutions to their nominated business. The event was held at the Melbourne Sports and Aquatic Centre (MSAC) on March 13th and came to be one of the most exciting Innovation Games ever held! The Excellent Edges team, ‘Running with Scissors’, took home second place on the day with their unique solution to surface a consistent revenue stream within their business. Excellent Edges were nominated and sponsored by the Australian Hairdressing Council, the national peak body for hairdressing professionals, educators and suppliers. As one of the Australian Hairdressing Council’s accredited product companies, Excellent Edges is the only scissor manufacturing company that manufacture their own products in Australia, and have been operating for over 30 years. This gives them a significant advantage in servicing their clients when it comes to scissor care and sharpening services. Excellent Edges pride themselves on not only the quality of their scissors sold, but the ongoing treatment received after the initial scissors purchase. However, the upfront cost of their product creates not only a barrier for entry but significantly reduces the opportunity for repeat customers. Each instalment of the COSBOA Innovation Games receives several hundred applications to participate. Besides tapping into our community of 13,000+ users, Paddl also promotes the event through educational institutions as well as various other marketing channels. Applicants can apply through paddl.com, and are competitively selected to form multidisciplinary teams based on quality of their application, area of study and level of experience. The Excellent Edges team, ‘Running with Scissors’ was represented by 12 people - a Paddl Alumni, 4 tertiary students, each from General Assembly, Swinburne Institute of Technology, Deakin University as well as a graduate from the Superior School of Design and Arts of Barcelona, 5 Excellent Edges employees, and a GrowthOps mentor. The group was professionally facilitated by a Paddl Facilitator. Meeting prior to event day via ‘Slack’ - an online communications tool - the team were able to introduce themselves to each other and receive important information and resources about the challenge day. 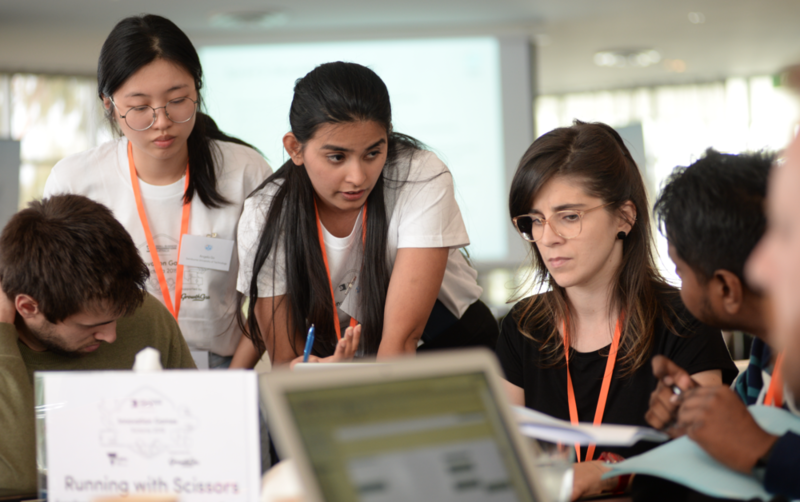 They banded together quickly and formed a team name; dubbing themselves, ‘Running with Scissors’ in honour of the core product their business produces. Keeping in mind the challenge theme of the day, the team educated themselves on Excellent Edges, their business model and prepared themselves. The first sprint involved the team understanding the business and how they operate. Being the only team with 5 key business representatives, the Running with Scissors team were set up well for the task! With a lot of deep questions and analytical thinking, the team formulated their current growth issues into three main pain points - the resource intensive nature of the business, high upfront customer costs and low ongoing retention of customers. Using these issues as their main focus points, the team began to build out a viable concept. The second sprint saw the Running with Scissors team come up with a subscription model that would help reduce upfront costs for customers and provide a consistent revenue stream for the business. By evolving from a traditional sales approach to a premium care experience, the team managed to reduce the reliance on individual sales reps and develop deeper ongoing relationships with customers. The team utilised the GrowthOps ‘Challenge Lab’ to get some outside perspective from subject matter experts on the validity of their idea and how to best execute it. The final leg of the day involved the team developing their innovative idea into a 5-minute presentation they would present to a panel of industry experts. The teams design skills shone in this sprint, as they crafted clear visual aids into a short, concise and energetic presentation, supported by the entire team getting involved, explaining thoroughly how the approach would work. The Running with Scissors’ pitch was effective, clear, and addressed all of the critical points in the judging criteria including surfacing high impact growth solution for the business, and if it is feasibly implementable into the business. Their solution fit the criteria of high-growth solution, taking into current constraints, whilst proving an effective reorganisation of their current resources and driving further revenue as a result. With much consideration, the solution presented by Running with Scissors was outstanding and the judging panel awarded the team second place! Paddl Co. takes pride in the positive experiences everyone walks away with from the Paddl Games - from emerging talent to business owners to sponsor participants. The next instalment of the COSBOA Innovation Games is here - applications are now open, so make sure to join paddl.com and get your profile up to date with the latest activity cards! If you are a small business interested in participating, please reach out to caitlin@paddl.co for further information.